Finally! Remember on my "thrift store goodies" post, I said I picked up something for a project but was waiting to show you! Well, now it's ready so get excited! 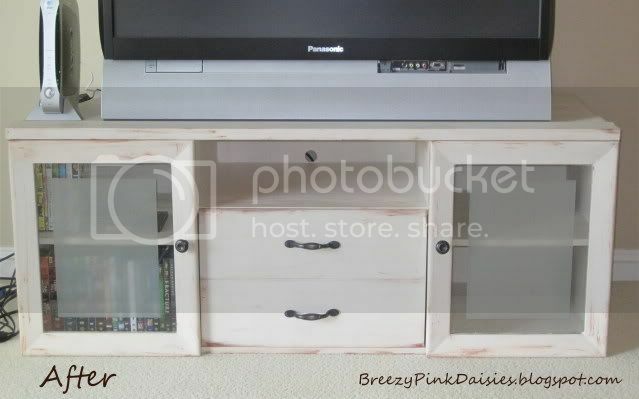 We had been looking at TV stands but hadn't found one we really liked...and I had been looking around different blogs and kinda wanted to try to make something myself. Here's a small overview of my process. Next, I got ready to paint! I used some paint that my in-laws had left over from painting their walls - Behr Antique White - not sure if it was the best type of paint to use on this project...because of the peeling I experienced, but that also might be because of a poor sanding job. 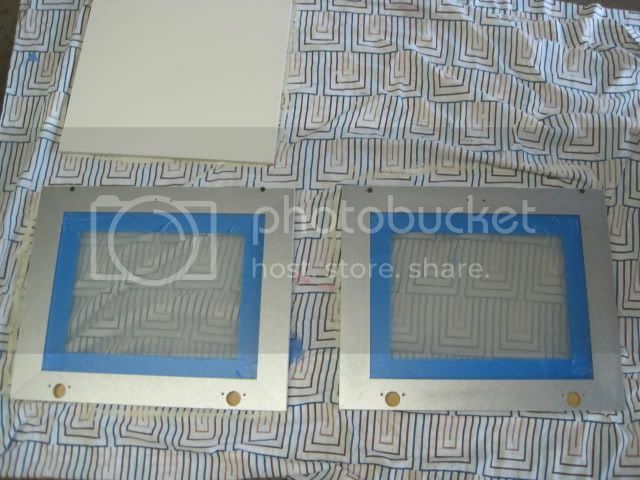 I taped the doors to paint them, see, still way too shiny...little did I know that would be a nightmare!!! The paint started peeling off in stripes after in dried, so I had to sand the doors down and pretty much remove all of that silvery stuff...it was annoying! Lesson learned: sand WELL and use good paint! 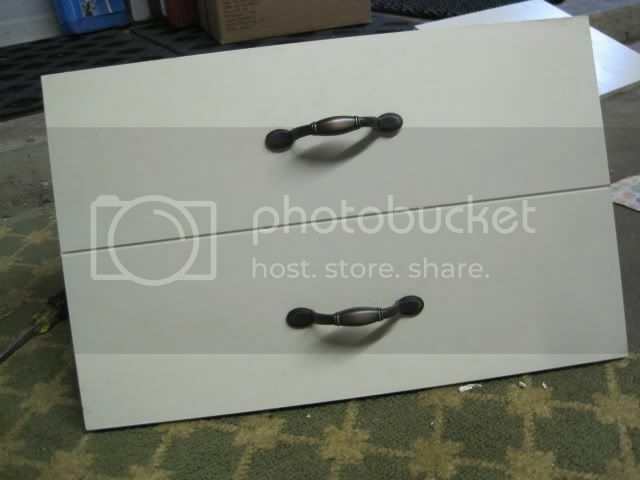 Got some new hardware for the drawer and doors at Wal-mart for $11. My dear hubby helped me put them on as it was quite difficult since we needed to make new holes. But he was great at that! Then, I started to distress it by adding some paint. I believe it was actually a rust primer spray paint that I used. I would spray it on a plastic bag first and then rub it on the edges and lightly across the entire thing. The plastic bag worked great because the paint didn't soak into it entirely, which gave me time to apply it to the TV stand. I also took off those crazy looking feet! And, there you have it! Our new TV stand for $42! I know it's not perfect, but I love it! And our TV (actually our friend's TV that we are currently borrowing) looks much nicer on a stand than sitting in the corner! Linking up at some of these lovely parties! 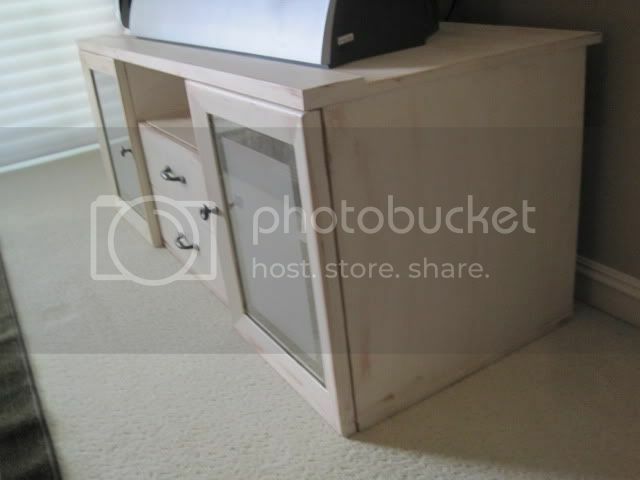 Love the tv stand Brie! You are so creative! What a great project! 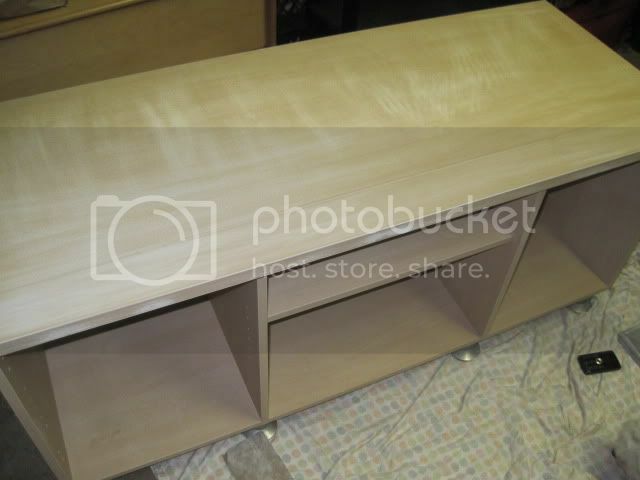 I have some furniture I need to make over like this... Thanks for the motivation! Your project turned out great! It looks so professional! Thanks for the idea and directions. You are so creative! I wasn't able to have such a great idea! i used to have that exact stand but i never painted mine so yours looks awesome! Looks awesome! I think almost every piece of furniture we own is something we either bought at a thrift store or someone gave us and then I painted. Gotta love it. I think it turned out great! it looks way better how you have it than it's original "modern" look. I have never been into modern furniture. Thanks for stopping by my blog! 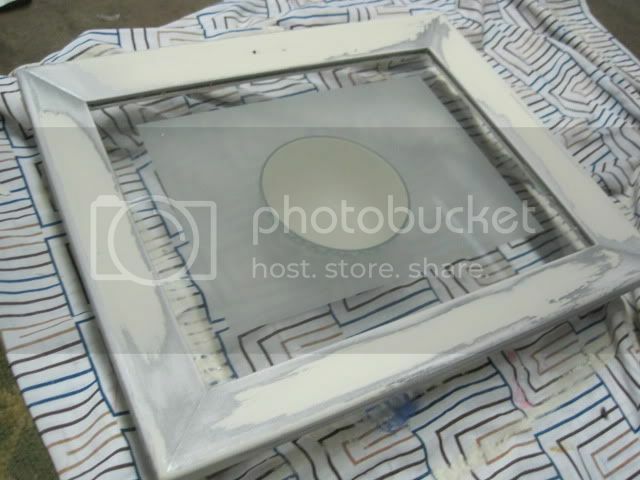 That frame is 16 X 20 and it was matted for an 11X14. I had originally planned to keep the mat in there, but when I tried it with the material I changed my mind. Such a cute transformation! I love taking old things and making them fit into my vision. I'm a new follower from the Monday Mingle. Such a cute site! Would love a follow back! I love this! It looks nothing like what you started with. this looks great! Thanks for stopping by my blog and for your comment! I love making new blog friends! I am your newest follower and would love it if you would follow me too! Thanks! Stop by and have a look for yourself. I used casters instead of legs. Perhaps that might appeal to you as well. Great blog! Stopping by from the blog hop! I am your newest follower and would love it if you would follow me too! Thanks! Those thrift store finds are the greatest!! Love it and all the room for storage you have.Awesome job! Wow Brie - this came out great! You could never guess that it started as what it did. Thanks for linking up to Saturday Social! 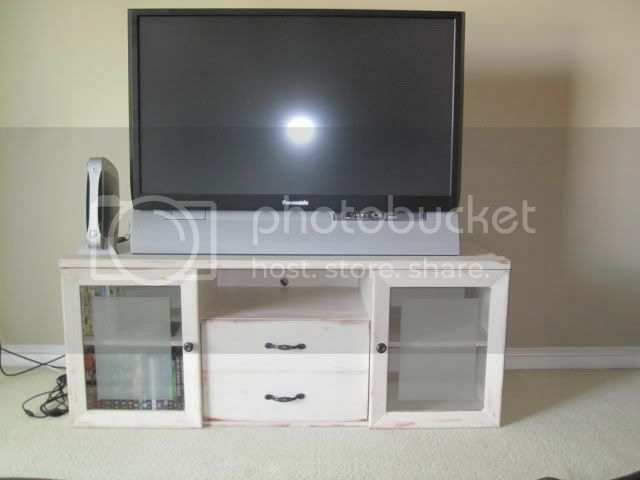 I can’t believe that’s the same TV stand! It looks amazing! 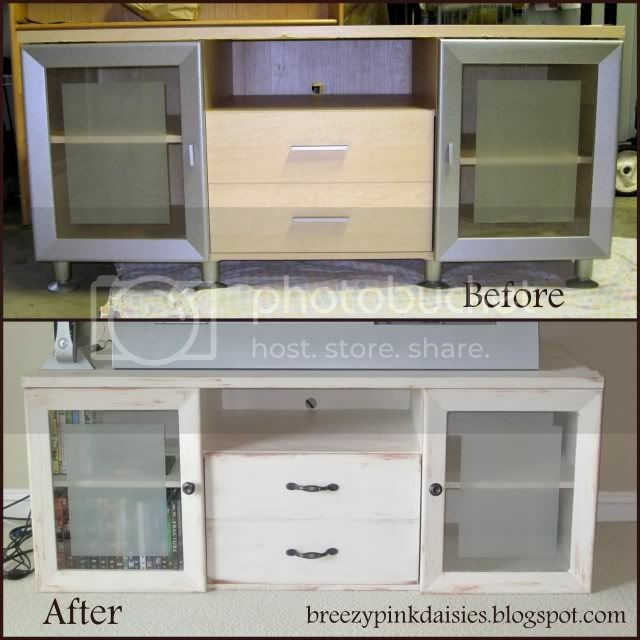 I’ve been looking for a new TV stand forever, maybe I should just makeover one! And of course paint it white! Haha! random question but what kind of paint did you use? like falt semi glossy? 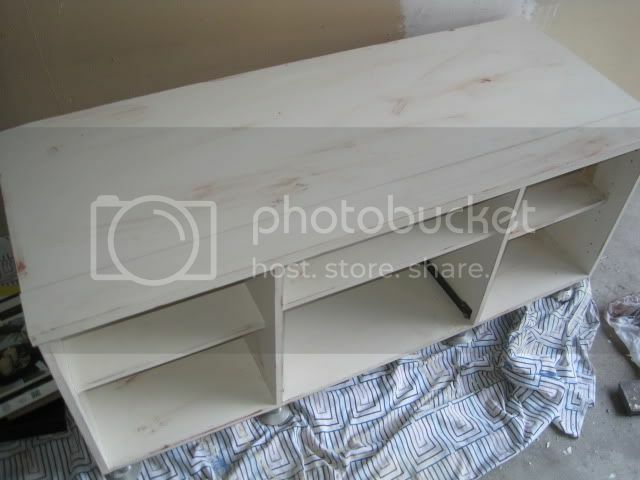 im painting a tv stand and i dont know what kind of paint to get. Clock: From Blah to BEAUTIFUL!! !